"Magnetic" and "Magnetized" redirect here. For other uses, see Magnetic (disambiguation), Magnetism (disambiguation), and Magnetized (disambiguation). Magnetism is a class of physical phenomena that are mediated by magnetic fields. Electric currents and the magnetic moments of elementary particles give rise to a magnetic field, which acts on other currents and magnetic moments. The most familiar effects occur in ferromagnetic materials, which are strongly attracted by magnetic fields and can be magnetized to become permanent magnets, producing magnetic fields themselves. Only a few substances are ferromagnetic; the most common ones are iron, cobalt and nickel and their alloys such as steel. The prefix ferro- refers to iron, because permanent magnetism was first observed in lodestone, a form of natural iron ore called magnetite, Fe3O4. Although ferromagnetism is responsible for most of the effects of magnetism encountered in everyday life, all other materials are influenced to some extent by a magnetic field, by several other types of magnetism. Paramagnetic substances such as aluminum and oxygen are weakly attracted to an applied magnetic field; diamagnetic substances such as copper and carbon are weakly repelled; while antiferromagnetic materials such as chromium and spin glasses have a more complex relationship with a magnetic field. The force of a magnet on paramagnetic, diamagnetic, and antiferromagnetic materials is usually too weak to be felt, and can be detected only by laboratory instruments, so in everyday life these substances are often described as non-magnetic. The magnetic state (or magnetic phase) of a material depends on temperature and other variables such as pressure and the applied magnetic field. A material may exhibit more than one form of magnetism as these variables change. As with magnetising a magnet, demagnetising a magnet is also possible. "Passing an alternate current, or hitting a heated magnet in an east west direction are ways of demagnetising a magnet", quotes Sreekethav. Lodestone, a natural magnet, attracting iron nails. Ancient humans discovered the property of magnetism from lodestone. An illustration from Gilbert's 1600 De Magnete showing one of the earliest methods of making a magnet. A blacksmith holds a piece of red-hot iron in a north-south direction and hammers it as it cools. The magnetic field of the Earth aligns the domains, leaving the iron a weak magnet. Drawing of a medical treatment using magnetic brushes. Charles Jacque 1843, France. Magnetism was first discovered in the ancient world, when people noticed that lodestones, naturally magnetized pieces of the mineral magnetite, could attract iron. 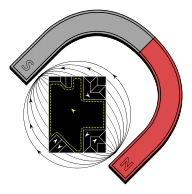 The word magnet comes from the Greek term μαγνῆτις λίθος magnētis lithos, "the Magnesian stone, lodestone." In ancient Greece, Aristotle attributed the first of what could be called a scientific discussion of magnetism to the philosopher Thales of Miletus, who lived from about 625 BC to about 545 BC. The ancient Indian medical text Sushruta Samhita describes using magnetite to remove arrows embedded in a person's body. In ancient China, the earliest literary reference to magnetism lies in a 4th-century BC book named after its author, The Sage of Ghost Valley. The 2nd-century BC annals, Lüshi Chunqiu, also notes: "The lodestone makes iron approach, or it attracts it." The earliest mention of the attraction of a needle is in a 1st-century work Lunheng (Balanced Inquiries): "A lodestone attracts a needle." The 11th-century Chinese scientist Shen Kuo was the first person to write—in the Dream Pool Essays—of the magnetic needle compass and that it improved the accuracy of navigation by employing the astronomical concept of true north. By the 12th century the Chinese were known to use the lodestone compass for navigation. They sculpted a directional spoon from lodestone in such a way that the handle of the spoon always pointed south. Alexander Neckam, by 1187, was the first in Europe to describe the compass and its use for navigation. In 1269, Peter Peregrinus de Maricourt wrote the Epistola de magnete, the first extant treatise describing the properties of magnets. In 1282, the properties of magnets and the dry compasses were discussed by Al-Ashraf, a Yemeni physicist, astronomer, and geographer. An understanding of the relationship between electricity and magnetism began in 1819 with work by Hans Christian Ørsted, a professor at the University of Copenhagen, who discovered by the accidental twitching of a compass needle near a wire that an electric current could create a magnetic field. This landmark experiment is known as Ørsted's Experiment. Several other experiments followed, with André-Marie Ampère, who in 1820 discovered that the magnetic field circulating in a closed-path was related to the current flowing through the perimeter of the path; Carl Friedrich Gauss; Jean-Baptiste Biot and Félix Savart, both of whom in 1820 came up with the Biot–Savart law giving an equation for the magnetic field from a current-carrying wire; Michael Faraday, who in 1831 found that a time-varying magnetic flux through a loop of wire induced a voltage, and others finding further links between magnetism and electricity. James Clerk Maxwell synthesized and expanded these insights into Maxwell's equations, unifying electricity, magnetism, and optics into the field of electromagnetism. In 1905, Einstein used these laws in motivating his theory of special relativity, requiring that the laws held true in all inertial reference frames. Electromagnetism has continued to develop into the 21st century, being incorporated into the more fundamental theories of gauge theory, quantum electrodynamics, electroweak theory, and finally the standard model. Spin magnetic moments of elementary particles. The magnetic properties of materials are mainly due to the magnetic moments of their atoms' orbiting electrons. The magnetic moments of the nuclei of atoms are typically thousands of times smaller than the electrons' magnetic moments, so they are negligible in the context of the magnetization of materials. Nuclear magnetic moments are nevertheless very important in other contexts, particularly in nuclear magnetic resonance (NMR) and magnetic resonance imaging (MRI). Ordinarily, the enormous number of electrons in a material are arranged such that their magnetic moments (both orbital and intrinsic) cancel out. This is due, to some extent, to electrons combining into pairs with opposite intrinsic magnetic moments as a result of the Pauli exclusion principle (see electron configuration), and combining into filled subshells with zero net orbital motion. In both cases, the electrons preferentially adopt arrangements in which the magnetic moment of each electron is cancelled by the opposite moment of another electron. Moreover, even when the electron configuration is such that there are unpaired electrons and/or non-filled subshells, it is often the case that the various electrons in the solid will contribute magnetic moments that point in different, random directions, so that the material will not be magnetic. The magnetic behavior of a material depends on its structure, particularly its electron configuration, for the reasons mentioned above, and also on the temperature. At high temperatures, random thermal motion makes it more difficult for the electrons to maintain alignment. Note that this description is meant only as a heuristic; the Bohr-van Leeuwen theorem shows that diamagnetism is impossible according to classical physics, and that a proper understanding requires a quantum-mechanical description. In a paramagnetic material there are unpaired electrons; i.e., atomic or molecular orbitals with exactly one electron in them. While paired electrons are required by the Pauli exclusion principle to have their intrinsic ('spin') magnetic moments pointing in opposite directions, causing their magnetic fields to cancel out, an unpaired electron is free to align its magnetic moment in any direction. When an external magnetic field is applied, these magnetic moments will tend to align themselves in the same direction as the applied field, thus reinforcing it. A ferromagnet, like a paramagnetic substance, has unpaired electrons. However, in addition to the electrons' intrinsic magnetic moment's tendency to be parallel to an applied field, there is also in these materials a tendency for these magnetic moments to orient parallel to each other to maintain a lowered-energy state. Thus, even in the absence of an applied field, the magnetic moments of the electrons in the material spontaneously line up parallel to one another. Ferromagnetism only occurs in a few substances; common ones are iron, nickel, cobalt, their alloys, and some alloys of rare-earth metals. The magnetic moments of atoms in a ferromagnetic material cause them to behave something like tiny permanent magnets. They stick together and align themselves into small regions of more or less uniform alignment called magnetic domains or Weiss domains. Magnetic domains can be observed with a magnetic force microscope to reveal magnetic domain boundaries that resemble white lines in the sketch. There are many scientific experiments that can physically show magnetic fields. When a domain contains too many molecules, it becomes unstable and divides into two domains aligned in opposite directions, so that they stick together more stably, as shown at the right. When exposed to a magnetic field, the domain boundaries move, so that the domains aligned with the magnetic field grow and dominate the structure (dotted yellow area), as shown at the left. When the magnetizing field is removed, the domains may not return to an unmagnetized state. This results in the ferromagnetic material's being magnetized, forming a permanent magnet. When magnetized strongly enough that the prevailing domain overruns all others to result in only one single domain, the material is magnetically saturated. When a magnetized ferromagnetic material is heated to the Curie point temperature, the molecules are agitated to the point that the magnetic domains lose the organization, and the magnetic properties they cause cease. When the material is cooled, this domain alignment structure spontaneously returns, in a manner roughly analogous to how a liquid can freeze into a crystalline solid. In an antiferromagnet, unlike a ferromagnet, there is a tendency for the intrinsic magnetic moments of neighboring valence electrons to point in opposite directions. When all atoms are arranged in a substance so that each neighbor is anti-parallel, the substance is antiferromagnetic. Antiferromagnets have a zero net magnetic moment, meaning that no field is produced by them. Antiferromagnets are less common compared to the other types of behaviors and are mostly observed at low temperatures. In varying temperatures, antiferromagnets can be seen to exhibit diamagnetic and ferromagnetic properties. In some materials, neighboring electrons prefer to point in opposite directions, but there is no geometrical arrangement in which each pair of neighbors is anti-aligned. This is called a spin glass and is an example of geometrical frustration. Like ferromagnetism, ferrimagnets retain their magnetization in the absence of a field. However, like antiferromagnets, neighboring pairs of electron spins tend to point in opposite directions. These two properties are not contradictory, because in the optimal geometrical arrangement, there is more magnetic moment from the sublattice of electrons that point in one direction, than from the sublattice that points in the opposite direction. An electromagnet attracts paper clips when current is applied creating a magnetic field. The electromagnet loses them when current and magnetic field are removed. Electromagnets are widely used as components of other electrical devices, such as motors, generators, relays, solenoids, loudspeakers, hard disks, MRI machines, scientific instruments, and magnetic separation equipment. Electromagnets are also employed in industry for picking up and moving heavy iron objects such as scrap iron and steel. Electromagnetism was discovered in 1820. As a consequence of Einstein's theory of special relativity, electricity and magnetism are fundamentally interlinked. Both magnetism lacking electricity, and electricity without magnetism, are inconsistent with special relativity, due to such effects as length contraction, time dilation, and the fact that the magnetic force is velocity-dependent. However, when both electricity and magnetism are taken into account, the resulting theory (electromagnetism) is fully consistent with special relativity. In particular, a phenomenon that appears purely electric or purely magnetic to one observer may be a mix of both to another, or more generally the relative contributions of electricity and magnetism are dependent on the frame of reference. Thus, special relativity "mixes" electricity and magnetism into a single, inseparable phenomenon called electromagnetism, analogous to how relativity "mixes" space and time into spacetime. All observations on electromagnetism apply to what might be considered to be primarily magnetism, e.g. perturbations in the magnetic field are necessarily accompanied by a nonzero electric field, and propagate at the speed of light. In a hard magnet such as a ferromagnet, M is not proportional to the field and is generally nonzero even when H is zero (see Remanence). The phenomenon of magnetism is "mediated" by the magnetic field. An electric current or magnetic dipole creates a magnetic field, and that field, in turn, imparts magnetic forces on other particles that are in the fields. Maxwell's equations, which simplify to the Biot–Savart law in the case of steady currents, describe the origin and behavior of the fields that govern these forces. Therefore, magnetism is seen whenever electrically charged particles are in motion—for example, from movement of electrons in an electric current, or in certain cases from the orbital motion of electrons around an atom's nucleus. They also arise from "intrinsic" magnetic dipoles arising from quantum-mechanical spin. The same situations that create magnetic fields—charge moving in a current or in an atom, and intrinsic magnetic dipoles—are also the situations in which a magnetic field has an effect, creating a force. Following is the formula for moving charge; for the forces on an intrinsic dipole, see magnetic dipole. is the angle between v and B. One tool for determining the direction of the velocity vector of a moving charge, the magnetic field, and the force exerted is labeling the index finger "V", the middle finger "B", and the thumb "F" with your right hand. When making a gun-like configuration, with the middle finger crossing under the index finger, the fingers represent the velocity vector, magnetic field vector, and force vector, respectively. See also right-hand rule. A very common source of magnetic field found in nature is a dipole, with a "South pole" and a "North pole", terms dating back to the use of magnets as compasses, interacting with the Earth's magnetic field to indicate North and South on the globe. Since opposite ends of magnets are attracted, the north pole of a magnet is attracted to the south pole of another magnet. The Earth's North Magnetic Pole (currently in the Arctic Ocean, north of Canada) is physically a south pole, as it attracts the north pole of a compass. A magnetic field contains energy, and physical systems move toward configurations with lower energy. When diamagnetic material is placed in a magnetic field, a magnetic dipole tends to align itself in opposed polarity to that field, thereby lowering the net field strength. When ferromagnetic material is placed within a magnetic field, the magnetic dipoles align to the applied field, thus expanding the domain walls of the magnetic domains. Since a bar magnet gets its ferromagnetism from electrons distributed evenly throughout the bar, when a bar magnet is cut in half, each of the resulting pieces is a smaller bar magnet. Even though a magnet is said to have a north pole and a south pole, these two poles cannot be separated from each other. A monopole—if such a thing exists—would be a new and fundamentally different kind of magnetic object. It would act as an isolated north pole, not attached to a south pole, or vice versa. Monopoles would carry "magnetic charge" analogous to electric charge. Despite systematic searches since 1931, as of 2010[update], they have never been observed, and could very well not exist. Nevertheless, some theoretical physics models predict the existence of these magnetic monopoles. Paul Dirac observed in 1931 that, because electricity and magnetism show a certain symmetry, just as quantum theory predicts that individual positive or negative electric charges can be observed without the opposing charge, isolated South or North magnetic poles should be observable. Using quantum theory Dirac showed that if magnetic monopoles exist, then one could explain the quantization of electric charge—that is, why the observed elementary particles carry charges that are multiples of the charge of the electron. Certain grand unified theories predict the existence of monopoles which, unlike elementary particles, are solitons (localized energy packets). The initial results of using these models to estimate the number of monopoles created in the big bang contradicted cosmological observations—the monopoles would have been so plentiful and massive that they would have long since halted the expansion of the universe. However, the idea of inflation (for which this problem served as a partial motivation) was successful in solving this problem, creating models in which monopoles existed but were rare enough to be consistent with current observations. centered at the nuclei A and B, see below. That this leads to magnetism is not at all obvious, but will be explained in the following. Here the last product means that a first electron, r1, is in an atomic hydrogen-orbital centered at the second nucleus, whereas the second electron runs around the first nucleus. This "exchange" phenomenon is an expression for the quantum-mechanical property that particles with identical properties cannot be distinguished. It is specific not only for the formation of chemical bonds, but as one will see, also for magnetism, i.e. in this connection the term exchange interaction arises, a term which is essential for the origin of magnetism, and which is stronger, roughly by factors 100 and even by 1000, than the energies arising from the electrodynamic dipole-dipole interaction.
. The "singlet state", i.e. the − sign, means: the spins are antiparallel, i.e. for the solid we have antiferromagnetism, and for two-atomic molecules one has diamagnetism. The tendency to form a (homoeopolar) chemical bond (this means: the formation of a symmetric molecular orbital, i.e. with the + sign) results through the Pauli principle automatically in an antisymmetric spin state (i.e. with the − sign). In contrast, the Coulomb repulsion of the electrons, i.e. the tendency that they try to avoid each other by this repulsion, would lead to an antisymmetric orbital function (i.e. with the − sign) of these two particles, and complementary to a symmetric spin function (i.e. with the + sign, one of the so-called "triplet functions"). Thus, now the spins would be parallel (ferromagnetism in a solid, paramagnetism in two-atomic gases). The last-mentioned tendency dominates in the metals iron, cobalt and nickel, and in some rare earths, which are ferromagnetic. Most of the other metals, where the first-mentioned tendency dominates, are nonmagnetic (e.g. sodium, aluminium, and magnesium) or antiferromagnetic (e.g. manganese). Diatomic gases are also almost exclusively diamagnetic, and not paramagnetic. However, the oxygen molecule, because of the involvement of π-orbitals, is an exception important for the life-sciences. The Heitler-London considerations can be generalized to the Heisenberg model of magnetism (Heisenberg 1928). The explanation of the phenomena is thus essentially based on all subtleties of quantum mechanics, whereas the electrodynamics covers mainly the phenomenology. gauss – the centimeter-gram-second (CGS) unit of magnetic field (denoted B). Some organisms can detect magnetic fields, a phenomenon known as magnetoception. In addition to detection, biomagnetic phenomena are utilized by organisms in a number of ways. For instance, chitons, a type of marine mollusk, produce magnetite to harden their teeth, and even humans produce magnetite in bodily tissue. Magnetobiology studies magnetic fields as a medical treatment; fields naturally produced by an organism are known as biomagnetism. ^ Du Trémolet de Lacheisserie, Étienne; Damien Gignoux; Michel Schlenker (2005). Magnetism: Fundamentals. Springer. pp. 3–6. ISBN 978-0-387-22967-6. ^ Platonis Opera, Meyer and Zeller, 1839, p. 989. ^ The location of Magnesia is debated; it could be the region in mainland Greece or Magnesia ad Sipylum. See, for example, "Magnet". Language Hat blog. 28 May 2005. Retrieved 22 March 2013. ^ Fowler, Michael (1997). "Historical Beginnings of Theories of Electricity and Magnetism". Retrieved 2008-04-02. ^ Kumar Goyal, Rajendra (2017). Nanomaterials and Nanocomposites: Synthesis, Properties, Characterization Techniques, and Applications. CRC Press. p. 171. ISBN 9781498761673. ^ The section "Fanying 2" (反應第二) of The Guiguzi: "其察言也，不失若磁石之取鍼，舌之取燔骨". From the section "Jingtong" (精通) of the "Almanac of the Last Autumn Month" (季秋紀): "慈石召鐵，或引之也]"
^ In the section "A Last Word on Dragons" (亂龍篇 Luanlong) of the Lunheng: "Amber takes up straws, and a load-stone attracts needles" (頓牟掇芥，磁石引針). ^ HP Meyers (1997). Introductory solid state physics (2 ed.). CRC Press. p. 362; Figure 11.1. ISBN 9781420075021. ^ Catherine Westbrook; Carolyn Kaut; Carolyn Kaut-Roth (1998). MRI (Magnetic Resonance Imaging) in practice (2 ed.). Wiley-Blackwell. p. 217. ISBN 978-0-632-04205-0. ^ Merzouki, Rochdi; Samantaray, Arun Kumar; Pathak, Pushparaj Mani (2012). Intelligent Mechatronic Systems: Modeling, Control and Diagnosis. Springer Science & Business Media. pp. 403–405. ISBN 978-1447146285. ^ Sturgeon, W. (1825). "Improved Electro Magnetic Apparatus". Trans. Royal Society of Arts, Manufactures, & Commerce. 43: 37–52. cited in Miller, T.J.E (2001). Electronic Control of Switched Reluctance Machines. Newnes. p. 7. ISBN 978-0-7506-5073-1. ^ Jackson, John David (1999). Classical electrodynamics (3rd ed.). New York: Wiley. ISBN 978-0-471-30932-1. ^ Milton mentions some inconclusive events (p. 60) and still concludes that "no evidence at all of magnetic monopoles has survived" (p.3). Milton, Kimball A. (June 2006). "Theoretical and experimental status of magnetic monopoles". Reports on Progress in Physics. 69 (6): 1637–1711. arXiv:hep-ex/0602040. Bibcode:2006RPPh...69.1637M. doi:10.1088/0034-4885/69/6/R02. .
^ Guth, Alan (1997). The Inflationary Universe: The Quest for a New Theory of Cosmic Origins. Perseus. ISBN 978-0-201-32840-0. OCLC 38941224. .
^ Kirschvink, Joseph L.; Kobayashi-Kirshvink, Atsuko; Diaz-Ricci, Juan C.; Kirschvink, Steven J. (1992). "Magnetite in Human Tissues: A Mechanism for the Biological Effects of Weak ELF Magnetic Fields" (PDF). Bioelectromagnetics Supplement. 1: 101–113. Retrieved 29 March 2016. David K. Cheng (1992). Field and Wave Electromagnetics. Addison-Wesley Publishing Company, Inc. ISBN 978-0-201-12819-2. Furlani, Edward P. (2001). Permanent Magnet and Electromechanical Devices: Materials, Analysis and Applications. Academic Press. ISBN 978-0-12-269951-1. OCLC 162129430. Griffiths, David J. (1998). Introduction to Electrodynamics (3rd ed.). Prentice Hall. ISBN 978-0-13-805326-0. OCLC 40251748. Tipler, Paul (2004). Physics for Scientists and Engineers: Electricity, Magnetism, Light, and Elementary Modern Physics (5th ed.). W.H. Freeman. ISBN 978-0-7167-0810-0. OCLC 51095685. Look up magnetism in Wiktionary, the free dictionary.